freezing vegetables is an easy way to keep a healthy stock of vegetables throughout the winter. Photos by Angela Sherman. I come from generations of farmers. My uncle Dale Haese still farms the land of our century farm purchased by my great-great-grandparents in 1891. I have wonderful memories of summers spent with my great–grandma, great–aunt and grandma harvesting from the garden and then preserving in the kitchen. I’m like my grandma in the kitchen – always working to feed an army, though she had an “army” of nine children, neighbors and farm hands and I only have my family of four. She instilled in me the value of hard work, homesteading and eating in season. So where to begin? Start a garden or befriend local farmers. The most important part of preserving is to have fresh produce and the best way to source it is to grow or buy directly from a local producer. When buying things I don’t grow myself, I use the hierarchy – locally grown and organic, locally grown, organic and then conventional. 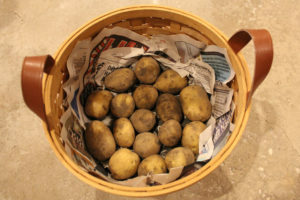 Potatoes can be simply stored in a basket lined with old newspaper in a cold, dark cellar. Two easy ways to preserve late summer and fall produce are storing and freezing. Onions, garlic, potatoes, squash and pumpkin can be stored in baskets using old Peninsula Pulse newspapers to line the bottom and create barriers in-between single-high layers and placed in a cellar, basement or cool and dark room. If you don’t have a good place for storing everything, potatoes and onions can be stored in the fridge; squash and pumpkin can be set on the floor or in a basket in your kitchen until used or processed. 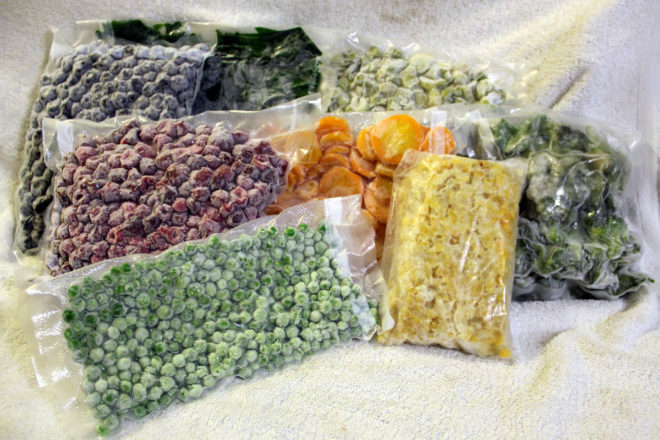 So many things can be frozen, some are as simple as putting them in bags and then the freezer while others require blanching prior to long-term storage. Cabbage, spinach and kale can go directly into the freezer for use in smoothies, soups, stir–fry and homemade dog food; tomatoes and peppers can also be frozen, whole or cut. Vegetables like beans, corn, carrots, broccoli, cauliflower, beets, peas, celery and even zucchini should be blanched before freezing. Blanching vegetables will stop the action of enzymes that cause color, flavor, texture and nutrient loss. 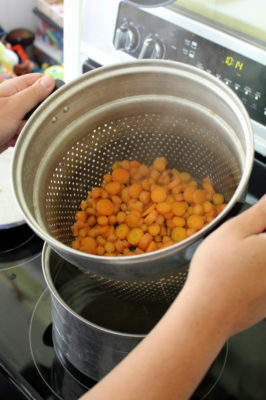 For blanching you’ll need a blanching pot, water, wooden spoon, cookie sheets and parchment paper or silicone baking mat; before I inherited a blanching pot I used a pot and steamer basket or slotted ladle. To blanche, bring a pot with water to a boil, add produce, then bring back to a boil stirring occasionally. 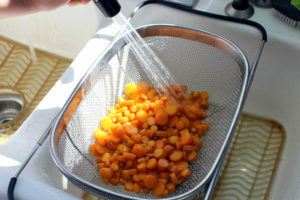 using a strainer makes removing the blanched veggies simpler and safer. Once it’s boiling with produce, remove and rinse with cold water. 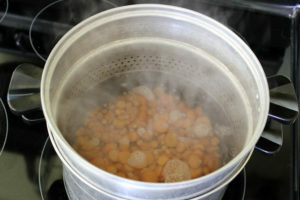 Boiling in small batches goes quicker and helps keep produce from getting mushy; test the first batch to make sure it is al dente, reduce time for more crunch and increase time for more softness, but remember you will be cooking them in the future so more al dente is preferred to keep it hard enough not to mush when used. Put blanched produce and fruits on half cookie sheets and place them in the freezer until frozen solid so they are easy to separate; use parchment paper or a silicon baking mat between produce and pan to prevent sticking. Once frozen, store them in food saver or freezer bags for future use. Rinsing blanched vegetables in cold water, also known as shocking, stops them from cooking further. 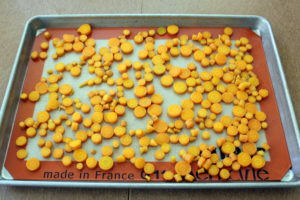 Spread the blanched vegetables out on a baking sheet to allow them to dry. Save blanching water in the fridge or freezer to use as liquid in homemade stock. You can even freeze carrot, celery, onion and garlic scraps in bags to use with meat bones to make amazing stock. Using the freshest produce possible will yield the best results. Never try to store or preserve moldy or spoiled produce and always use the oldest or aging stored produce first. Not sure you have enough freezer space? Pick up the autumn 2017 issue of Door County Living magazine for tips and recipes on water bath canning, another great way to help you eat local all year long.